Do you know what is Hidden in the food items you buy? 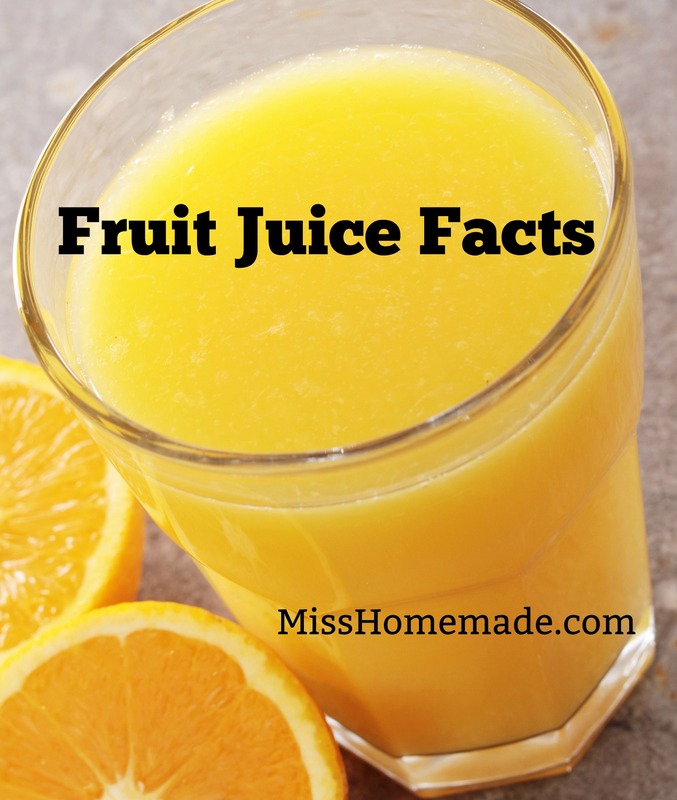 I have fruit juice facts you must know that you probably never thought of. Heck, I never thought about it years ago either. Fruit juice facts is part of my website now where I tell you what to look for and stay away from when grocery shopping (new!). I also offer 800 pages -5,000 homemade recipes from scratch here (even the ingredients) at MissHomemade.com so you may want to bookmark it. If you would like to sign up to receive my updates please go to the bottom of the page. Today I’m going to touch on a subject that you probably haven’t thought about - fruit juice. When I bought orange juice I would check labels and buy 100% juice and not the frozen canned kind (it wasn’t as good anyway). That’s the way you do it too, right? The juice tasted like you just squeezed fresh oranges and the pulp made it more believable. When the words “natural” or in this case, 100% juice is on the label, you assume it is juice from oranges – that’s it. It’s not. Tropicana, Minute Maid, Simply Orange brands have their own distinctive taste and I know you all have your favorite brand. Why wouldn’t they all taste the same because all that is in the juice is 100% juice, right? If you juice oranges today in Iowa and then was in Florida and juiced their oranges (or anywhere in the world), there would be a noticeable difference. Maybe some of the oranges in Iowa weren’t ripe enough or were older. Oranges grow in Florida, so they should be the best tasting - are you following me? Well, that’s my thinking on this subject. No matter where you were the juice would never taste exactly alike. The orange juice does have other things in it and they have a recipe to make it. Soft drinks always taste the same, right? Well that 100% orange juice is processed in the same way. When the juice is stripped of oxygen it is also stripped of flavor providing chemicals. Juice companies therefore hire flavor and fragrance companies, the same ones that formulate perfumes for Dior and Calvin Klein, to engineer flavor packs to add back to the juice to make it taste fresh. Flavor packs aren’t listed as an ingredient on the label because technically they are derived from orange essence and oil. Yet those in the industry will tell you that the flavor packs, whether made for reconstituted or pasteurized orange juice, resemble nothing found in nature. The packs added to juice earmarked for the North American market tend to contain high amounts of ethyl butyrate, a chemical in the fragrance of fresh squeezed orange juice that, juice companies have discovered, Americans favor. Mexicans and Brazilians have a different palate. Flavor packs fabricated for juice geared to these markets therefore highlight different chemicals, the decanals say, or terpene compounds such as valencine. The formulas vary to give a brand’s trademark taste. If you’re discerning you may have noticed Minute Maid has a candy like orange flavor. That’s largely due to the flavor pack Coca-Cola has chosen for it. Some companies have even been known to request a flavor pack that mimics the taste of a popular competitor, creating a “hall of mirrors” of flavor packs. Despite the multiple interpretations of a freshly squeezed orange on the market, most flavor packs have a shared source of inspiration: a Florida Valencia orange in spring. If you like orange juice and want to buy American, now is the time. Only during the spring time can you pick up a carton that contains Florida Valencia juice that has not spent months in storage.